Revive your spirits in the peaceful surroundings of Wakkerstroom, only 3 hours from Pretoria and Johannesburg. Wakkerstroom is an exceptionally scenic destination, characterised by it’s mountainous setting with kloofs, mountain springs, vlei areas, dams. The area is internationally renowned as a “Birders” paradise, home to the Wakkerstroom Wetland and many globally-threatened bird species. Under new management and recently renovated, the Wakkerstroom Country Inn is situated on the square in the heart of the village, offering the ideal base from which to explore the village’s many fascinating attractions and the picturesque surrounds of Wakkerstroom. Wakkerstroom Country Inn has 10 comfortable and stylishly decorated en-suite rooms, a cosy bar and a variety of dining areas with a popular restaurant that is open 7 days a week for breakfast, lunch and dinner. There are also meeting facilities, as well as indoor and outdoor play areas for children. Any pizza (at the normal price) served with a free Castle Light/ Black Label/ Hansa Beer or a glass of Wine! 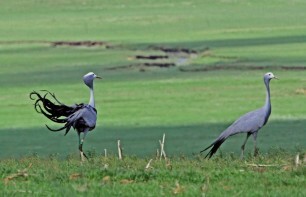 Visitors to Wakkerstroom are able to see South Africa’s National Bird, the Blue Crane – a common bird sighting in Wakkerstroom.